My post about the Gottingen Stadtfriedhof in central Germany and the sense of abandonment I felt whilst there, got me thinking. It made me think closer to home and so now I stand in Earlsfield Cemetery in Wandsworth, south London. At the dawn of the 20th Century European nations were tied together by many separate treaties, which often overlapped and conflicted with each other. Most were self-serving ‘tripwires’, set along the same old political, economic and military fault lines that had dominated Europe for more than two centuries. These fractured relationships and ‘wasp nest’ like bundles of treaties would lead to a spiral of a tension that would ultimately throw all into the maelstrom of the First World War. To be repeated just over 20 years later with the Second World War and the resulting two billion plus deaths. Putting aside the huge debate of the causes of both the First and Second World Wars, let’s think about what happened on the ‘home front’ instead. Both wars changed Britain and if the first stirred debate about how society might be better and more fairly run, the second saw words turn into action in far reaching ways. A starting point for this line of thought might be that WW1 saw an improvement in the living situations of many British people, people that were near or below the poverty line saw a rise in their well being – in the armed services great numbers of young men were being fed better, housed better, and they received a regular wage, not much, but enough to contribute to a household where it could make a difference to the whole family. Additionally, civilians, and this included women, were able to find work in arms factories etc., and money moved where it had not before. In general people ate better and their living standards grew despite the carnage and sorrow of war. Post WW1, unemployment exploded and a world-wide recession bit hard leading to a General Strike in the 1920’s in the UK which the unions failed to win and a return of the pre-war status quo prevailed. A great fear of the time was the precedent for change via revolution as witnessed in Russia in 1917. People received health care whilst in the services or, in the case of civilians injured through enemy action, and this was based on their need and not what they could afford! WW2 saw much the same, but whereas not much had really changed post WW1 other than amendments to Poor Law Acts, after WW2 the Conservative Party, led by the war winning hero Winston Churchill, was rejected by the populace in the 1945 General Election. Instead the electorate embraced the Labour Party’s call for social reform and that included universal health care! When you stand in a UK cemetery and you observe a Common Wealth War Grave or a civilian war monument you should not just think of the loss of life, but also that it was the fallen and injured of WW1 and 2 who in essence were the catalyst for the NHS. The NHS can trace its history back to the creation of a centralised state-run ‘Emergency Hospital Service’ (or Emergency Medical Service) during WW2. Some 2,378 hospitals were included to meet the huge loss of life and injuries that was expected. Prior to WW1 and WW2 health provision in the UK was uncoordinated, dependent on the differing actions of individual charities, local authorities and care given to those who could best afford it. This meant that health care was often out of reach for a great many people. A degree of free or affordable care was available from voluntary charitable hospitals, and some local authorities operated healthcare for local ratepayers. The London County Council for example, in 1930 took control of 140 hospitals, when they and other local authorities took advantage of the ‘Local Government Act of 1929’ which abolished the system of ‘Poor Law Unions’, transferring their powers to local authorities. Preceding both World Wars, for many it was the prevailing lack of affordable health care, the poor health of much of the population, high levels of disease, poor housing (squalid slums), exploitation, malnutrition and illiteracy that sparked political and social debate, trade union activism and reformist ideas across the social and political spectrum. Predating the formation of the ‘Emergency Hospital Service’ during WW2, the First World War care of war casualties had been taken up by the ‘Army Medical Service’ which brought much health care provision under a central command linking hospitals and clinics together, and such was the size of this task that 352 ‘auxiliary’ hospitals were established in the London district alone. Importantly the budget for both WW1 and WW2 health care was also borne by central government and the tax payer as part of the war effort. Post WW1 the loss of ‘war money’ for health etc. was widely debated, and during the 1930s the Labour Party adopted an embryonic policy for the formation of a National Health Service. Britain mobilised the whole country and all of society during both wars and this created a huge sea change, reform was stymied at first after WW1 (think also women in work), but by the end of WW2 a sense for the need for change had become deeply embedded, which in turn became the building block of the National Health Service. The WW1 dead service men and women that lie in Earlsfield cemetery mostly come from ‘General Hospital Number 3’ in Wandsworth, and what happened in this ‘auxiliary’ hospital was echoed across Britain. Some of the dead would have lost their lives in accidents, from illness (a good number who lie in the nearby Battersea Rise Cemetery died from pneumonia) or enemy action within the UK. Others would have been taken from the frontlines across Europe (and the world) and treated in ‘General Hospital Number 3’ (and the like), and if they died they were often buried at Earlsfield. If they passed away at the battle front they remained in a ‘foreign field’ near where they fell. ‘General Hospital Number 3’ was formerly known as the ‘Royal Victoria Patriotic Asylum’ and this charity hospital was tellingly formed to meet the needs of orphaned daughters of those who had died during the Crimean War (1854-1856). It is a sad reflection of the times that veterans of war and their families faced extreme poverty on demobilisation and they had to turn to charity for their most basic of needs. James Collis who lies within Earlsfield Cemetery sold his Victoria Cross for pennies (he was awarded Britain’s highest gallantry medal in Afghanistan in 1881). Other recipients were forced to do the same, poverty amongst veterans was prevalent and many poor laws were enforced or amended because of their high visibility (begging) on the streets. During WW1 and in the six years before ‘General Hospital Number 3’ closed in August 1920; it had treated 62,708 patients from all over the British Empire. WW2 health care, now organised under the auspices of the ‘Emergency Hospital Service’ order, was run on a regional basis, therefore many of the dead in the cemetery from that war came from a variety of hospitals all over south London. A major factor of the German attacks on London (and other cities) was that hospitals were often damaged or destroyed by air raids, flying bombs and missiles. This resulted in many patients being evacuated to safer areas or hospitals dispersed away from railway lines etc. Buried in a family plot and as the family stone fades the Commonwealth grave remains clear. 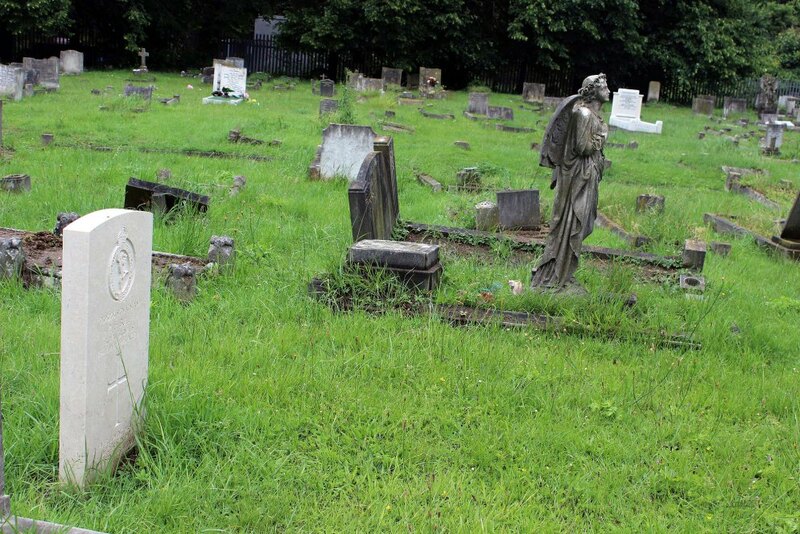 Earlsfield cemetery contains 477 Commonwealth burials from 1914-1918 and 115 from 1939-1945, there are also monuments to those who were cremated or lie in an unmarked grave and these are named on memorial walls. They include members of the Women’s Auxiliary RAF, New Zealanders, Australians, Irish (north and south), South Africans and of course both military and civilians from across Britain. Most of the WW2 dead are scattered amongst the general plots whilst those of WW1 are more grouped together. The oldest of the Commonwealth War dead, at 62, was VC recipient James Collis and one of the youngest was AE Wilkes who died in 1916 aged 17 or RM Murray of the ‘Artists Rifles’ who died aged 18 in 1918. We should also include Wendy Manning, aged one (and her father) who died from ‘enemy action’ in 1944, or George Green who was killed in the ‘Cinderella Dance Club’ (Putney) in 1943 aged 19. The newest military plot is from the Iraq War when in 2007 James Cartwright was killed whilst on active duty. Some service women and men are buried in family plots. There are no German burials at the cemetery, with a few exceptions most ‘enemy’ dead were interred at the German Military Cemetery at Cannock Chase or Brookwood in Woking (sharing with American and other Allied nations including Britain). In all but name a selective national health service existed during WW1, and this was even more so in WW2. And although a National Health Service was not made real after the first World War, the sacrifice of the second saw reformists make sure that the opportunity missed the first time would not be missed again. Much of Britain’s post war framework was mapped out in a report by the Liberal economist Sir William Beveridge. He named “five giants” – Want, Squalor, Ignorance, Disease and Idleness, that would be addressed by society by all paying a simple flat rate contribution each week into an insurance scheme. In 1946 the NHS was formed and came into being On July 5 1948, providing universal coverage and free health care at the point of delivery. 67,000 civilians were killed in the UK during WW2 and scores more injured. (383,700 Commonwealth service men and women died across all theatres of the war). You will find that it doesn’t take long for a search of local websites or blogs to reveal personal stories that can help bring the terror of the ‘Blitz’ etc. a little closer to you and the reasons why people voted for a NHS in 1945 (My current home in London had been badly damaged by bombing in the 1940’s and houses nearby were destroyed). When I look at the military and civil war dead in Earlsfield or any other cemetery within the UK, I reflect that it was their lives that the NHS is built upon. Let’s hope that it doesn’t take another World War to remind us all of what we’ve gained and what we may lose. J.C Collis was awarded the Victoria Cross in Afghanistan in 1881 only to have it taken away for committing bigamy and after spending time in prison he reenlisted in the army in his late 50’s as a drill sergeant in WW1. He had sold his medal to make ends meet, but after review and after his death he was re-awarded it. He was then also moved from a paupers grave to rest in a Commonwealth War Grave which notes his VC.